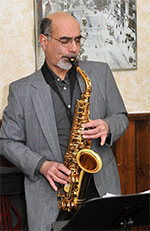 Formed in 2009, the Jazz Connection plays a variety of mainstream jazz from the 1920s to the present, with an emphasis on swing and cool jazz from the 1950s and 1960s. We have performed at weddings, private parties, restaurants, and a variety of other venues in New York State's Capital District. Our style of playing is very light and soothing, making it a perfect setting for restaurants, cocktail and wine parties.